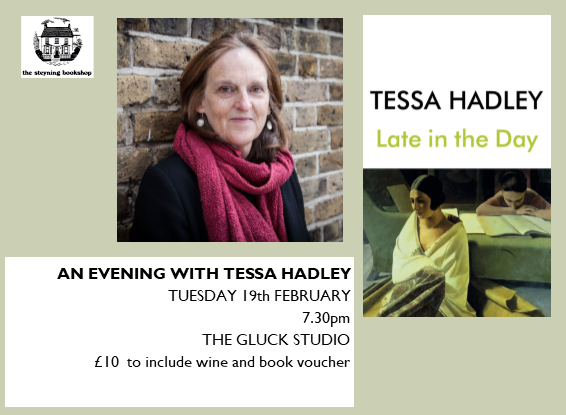 We are very excited to welcome the acclaimed novelist and short story master Tessa Hadley to Steyning for the first time. Tessa will be discussing her latest novel, ‘Late in the Day‘, the story of two close-knit couples, and how their lives are irrevocably altered by an untimely death. The novel explores the complex webs at the centre of our most intimate relationships, to expose how, beneath the seemingly dependable arrangements we make for our lives, lie infinite alternate configurations. Tessa’s six previous novels include ‘Clever Girl’, ‘The Past’ and ‘Married Love’. Her novels have twice reached the longlists of the Orange Prize and the Wales Book of the Year, and in 2016, she won one of the Windham-Campbell Literature Prizes for fiction. Tessa also teaches creative writing at Bath Spa University. Tickets are £10, to include a voucher towards a copy of ‘Late in the Day’ which is released in hardback on 14th February. Wine, soft drinks and nibbles will be served. Tickets are available by calling the bookshop on 01903 812062.